Here's one of the secrets to how we do this dinner. 4 pages of prep lists. 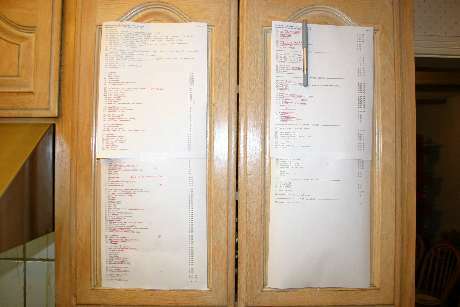 Each task has a code number for which dish (the list of dishes and numbers is at the top of the prep list for reference), a brief line about what needs done, and an approximate time when that task should start. As the day goes on, we simply work down the list, task by task, crossing items off, until everything is ready to go. The above picture was taken right before the guests began to arrive, or maybe just after the souflees were served. Some items like "10) pull from fridge" take 30 seconds to complete. Others, such as "17) make dobos sponge" which involve the separating of 30 eggs and baking the sponges in 4 batches in the oven can take over an hour to finish. I put lots of little things that I know I'll forget, such as "12) LIGHT FIRE". Since we started using this method, there have been very few things forgotten, even in the heat of battle. If for some crazy reason you want to see all of the prep lists, they are in the full entry. Oh, and "MEP" is shorthand for "Mis en Place" which means to gather together everything you need.